The annual New Year’s press conference in Paris was attended by reporters from the business press, daily newspapers, radio and television, as well as specialized aerospace trade publications. Arianespace is targeting another busy year of activity in 2016 – continuing its launch services excellence by performing up to 11 missions utilizing Ariane 5, Soyuz and Vega, while reinforcing its international marketplace competitiveness with commercial offers that combine the company’s attributes of reliability, availability and price. Meeting with journalists for the annual New Year’s press conference in Paris this morning, Chairman and CEO Stéphane Israël said Arianespace has set its sights on the longer term as well, preparing for the future commercial introduction of Ariane 6 and Vega-C.
“With the increased market competition, Arianespace will rely on its strengths as the most reliable launch operator, today and tomorrow,” he told journalists. 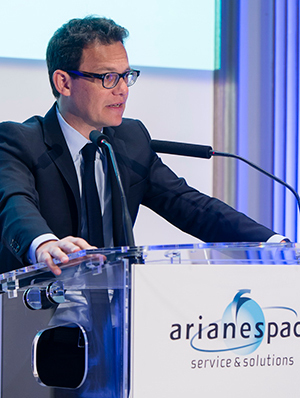 Chairman & CEO Stéphane Israël outlines Arianespace’s 2016 launch planning for reporters during the company’s traditional year-opening press conference in Paris. Building on its all-time best performance last year with 12 total launches (consisting of six Ariane 5 liftoffs, and three each for Soyuz and Vega), Israël said the pace of the 11 flights in 2016 will be set by as many as eight Ariane 5 missions – a new record for this heavy-lift vehicle. Completing the planned manifest are two launches of the lightweight Vega and one medium-lift Soyuz. Two of the Ariane 5 missions will be performed with single commercial telecom relay payloads in the first quarter of 2016: lofting Intelsat 29e on January 27 and EUTELSAT 65 West A in early March. Also planned in 2016 is the initial Ariane 5 flight carrying four Galileo spacecraft, complementing the dual-payload capacity employed by Soyuz in building out Europe’s satellite navigation network. Both Vega launches during the coming 12 months will deliver commercial payloads to Sun-synchronous orbit – a core market for Arianespace’s light-lift vehicle. A summer liftoff will loft PeruSat-1 for the Peruvian government, along with Skysat satellites for Google + Skybox Imaging; while a year-end flight will orbit Göktürk-1A for the government of Turkey. Completing the planned activity in 2016 is a Soyuz launch in April with Europe’s Sentinel-1B Earth observation spacecraft – Arianespace’s third at the service of the European Union’s Copernicus program. 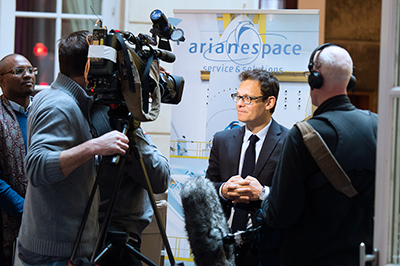 Members of the international news media pursue follow-up questions with Chairman & CEO Stéphane Israël following completion of Arianespace’s New Year kickoff press conference. In his New Year’s briefing with journalists today, Israël underscored the importance of Ariane 6 and Vega-C for Arianespace’s continued competiveness – bringing lower launch costs, increased flexibility and an enhanced response to such market trends as the creation of spacecraft constellations, the demand for increased space-based connectivity and the development of all-electric satellites. He added that Arianespace will begin commercial offers with Ariane 6 and Vega-C after their Program Implementation Review, expected this fall, and noted that “Users’ Clubs” are being created for both launchers. 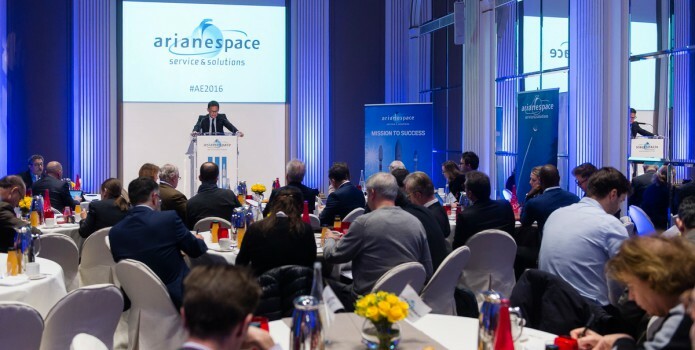 The Ariane 6 Users’ Club met last September in cooperation with prime contractor Airbus Safran Launchers, to be followed by the Vega-C Users’ Club this year in conjunction with prime contractor ELV. “These two extremely ambitious launchers are Europe’s best answer to growing competition, responding to the requirements of both our institutional customers and international commercial clients,” Israël concluded. For a complete review of Arianespace’s 2015 performance and its 2016 outlook, see the press release. Download high-resolution versions of this story’s photos in the Gallery.